The Celery Stalker (Apium stalkerous) was created one pleasant day, with the birds singing and joy everywhere, somebody was missing it all playing Godville indoors and missing out on it all while eating a horrible celery stalk (yuck). The Celery Stalker looked at the celery stalk and proclaimed that it was stalking him, he then put it down and proclaimed that its eyes had followed him (I know, a celery with eyes? He was quite crazy). He then giggled and mumbled to his crazy old self "A celery stalking me? Her hee, I'm funny", pondering this further he came to a conclusion "Celery Stalker would be a great name for a Godville monsters." 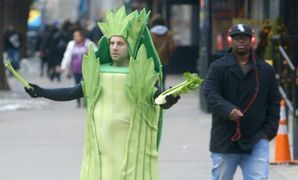 He submitted it to the ideabox, forgetting the celery stalk still looking at him. He was never seen nor heard from again. No other strengths known. Unless this is a strength?